On Saturday, April 7th from 6pm-9pm will be an evening of “West of Hell”, whiskey and cigars at Studio 21 Tattoo. 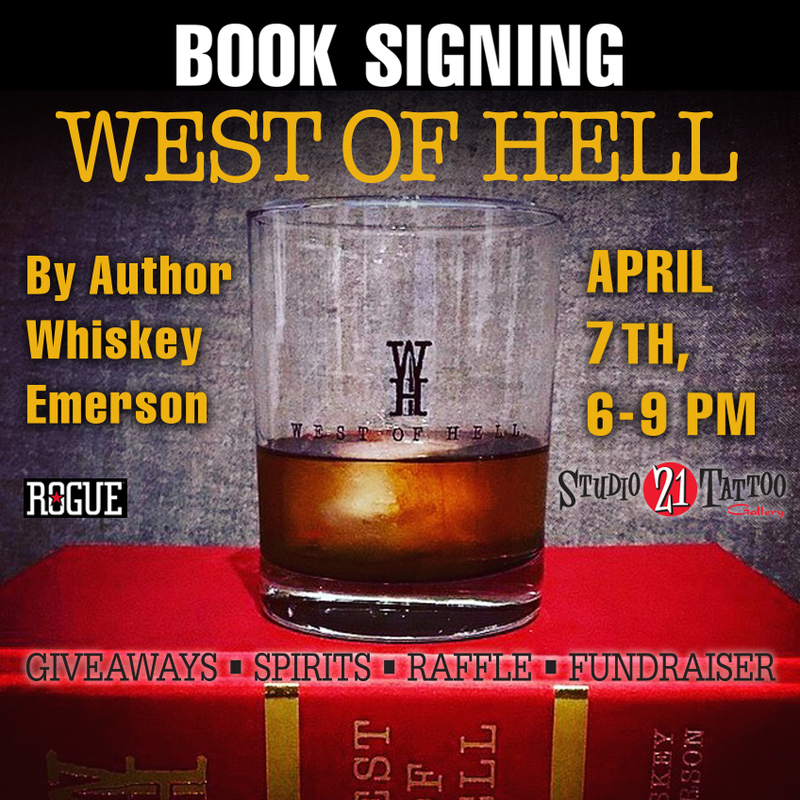 An event regarding the book signing of Whiskey Emerson’s “West of Hell” book, first of a trilogy. Swing by and meet the author and enjoy a little whiskey, beer and conversation. Rogue Ales & Spirits out of Oregon, will be providing samples of their tasty liquor brands. There wil be $50 tattoos based on the character logos that Charlie Spencer illustrated for the chapters in the book. A flash sheet of the tattoos will be posted soon on our social media. All proceeds from the tattoos wil go to St. Jude’s Ranch, one of Studio 21 Tattoo’s favorite charities. A discount of $10 will be offered on the first 10 books sold, in addition to free “West of Hell” whiskey glasses given to the first 20 people in the door. All books will be signed by Whiskey Emerson, adventurist, world traveler, author and renegade. There will be a raffle for a $100.00 Studio 21 Tattoo Gift Certificate and for a civil war replica of a Griswold pistol. Looking forward to seeing everyone. Whiskey Emerson’s book is avaiable on Amazon as well as Barnes & Noble, to name a few sources. If you were wondering what the book is about…here’s a llittle teaser. One hundred and fiftey years ago, New York City was not the city it is today. It was a hellish metropolis, a machines fueled and controlled by political corruption, murder, violence, and extortion. A place where no life was sacred…a place not for the faint of heart. Welcome to the world of West of hell, book one of the West of Hell trilogy.